On the eve of Prince Harry's second Invictus Games Being held in Orlando, Florida, this spring, the fifth-in-line to the British throne has shown he is a new kind of royal. Harry, hardworking and devoted, witnessed first-hand the toll war takes during his 10 years in the British Army, having served two tours in Afghanistan. Now he is fighting a different battle, raising awareness about the challenges our heroes face. "When you look past the amputees, when you look past the burns, they're still the same people, and to be able to call them all my comrades, friends, we all share something," Prince Harry told "Good Morning America" co-anchor Robin Roberts. "We share that uniform. We share the training. We share, in some cases, Afghanistan. It’s very special." With age, the 31-year-old Prince Harry has finally reconciled his public versus private personas, coming to terms with his life as Capt. Wales and Prince Harry. "I suppose, inevitably, [I was] going to have to get to the stage where I was always going to be Prince Harry," he told Roberts. "Despite the fact that I always wanted to be Capt. Wales, treated the same and the same uniform as everybody else, that acceptance, the power that the name has." Prince Harry is just one of the guys. He expected no special treatment during his decade-long service in the military, where he rose to the rank of Apache helicopter commander. Harry told Roberts he is committed to using his birthright and name to make a significant impact. "We will do everything we can to make sure that she's never forgotten and carry on all the special gifts, as such, that she had and that she portrayed while she was alive," Prince Harry said of his late mother, Princess Diana. Like their mother, who changed the world in so many ways, Prince Harry and his older brother, Prince William, are harnessing that power to draw attention to their charitable work. "I hope that a lot of my mother's talents are shown in a lot of the work that I do," Prince Harry reflected. 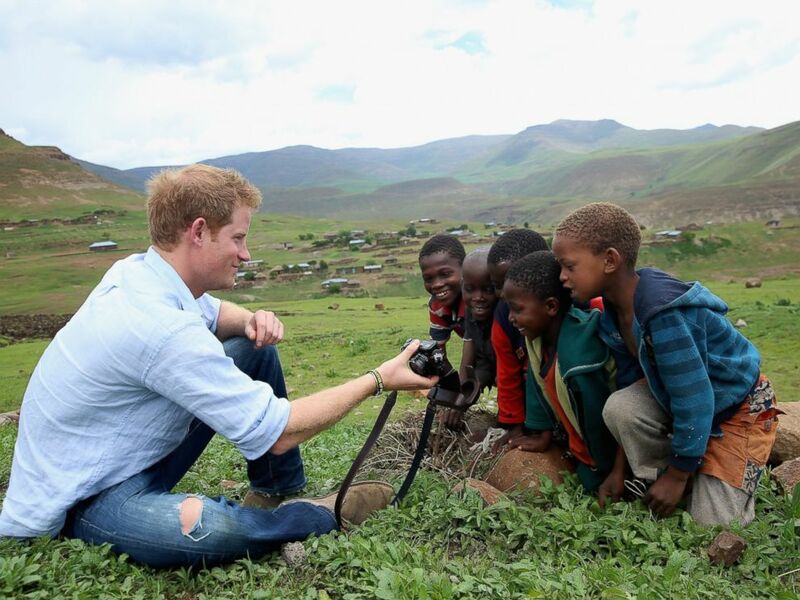 Prince Harry shows children a photograph he has taken on a digital camera during a visit to a herd boy night school constructed by Sentebale on Dec. 8, 2014 in Mokhotlong, Lesotho. Prince Harry formed the charity Sentebale, which means "Forget Me Not," in honor of Princess Diana to aid the vulnerable African children of Lesotho, many of whom are struggling with AIDS. Diana famously changed the perception of AIDS in her lifetime. Prince Harry said he hopes his mother would be pleased with all he and his brother have accomplished. "I hope she's looking down, you know, with tears in her eyes, being incredibly proud of what we've established, I suppose," Harry said. "I'm sure she's longing for me to have kids so she can be a grandmother again." "I hope that everything we do privately and officially, that it makes her proud," he said. "I think losing your mother at such a young age does end up shaping your life massively. Of course, it does, and now I find myself trying to be there and give advice to other people who are in similar positions." Prince Harry plays with two young children during a visit to the organisation supported by Sentebale, "Touching Tiny Lives," on Dec. 8, 2014 in Mokhotlong, Lesotho. Prince Harry said he relishes his role now as uncle to William and Kate's two children, Prince George and Princess Charlotte. "You've got to have fun in life. Otherwise, wow, imagine life without fun," Harry said. "You’ve got to be taken seriously, but I hope that I’m a fun uncle." Harry added that Prince Charles has helped him find his own path in life in many different ways. 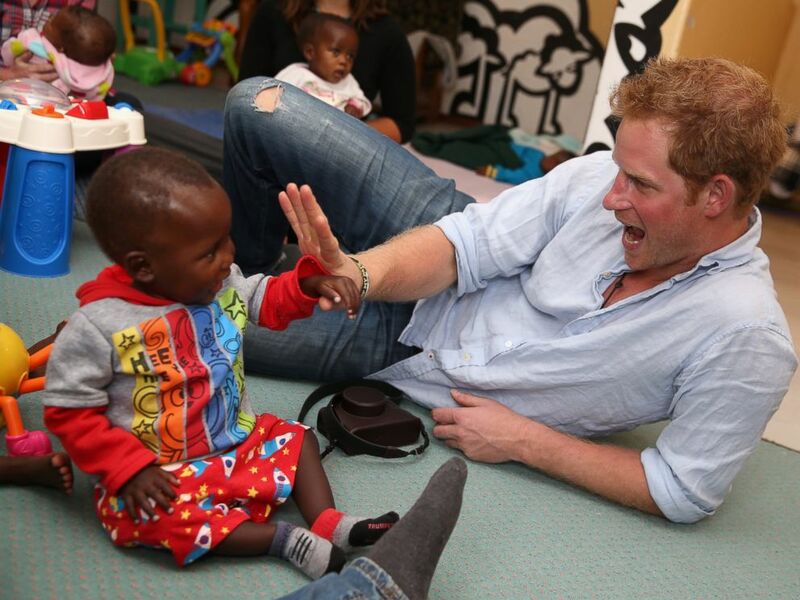 Prince Harry told Roberts he, too, hopes to have children soon and longs for the day when he will become a father. "I can’t wait for the day. So, you know, it will be fantastic," Harry said. "I've got a kid inside of me. I want to keep that. I adore kids. I enjoy everything that they bring to the party. They just say what they think." 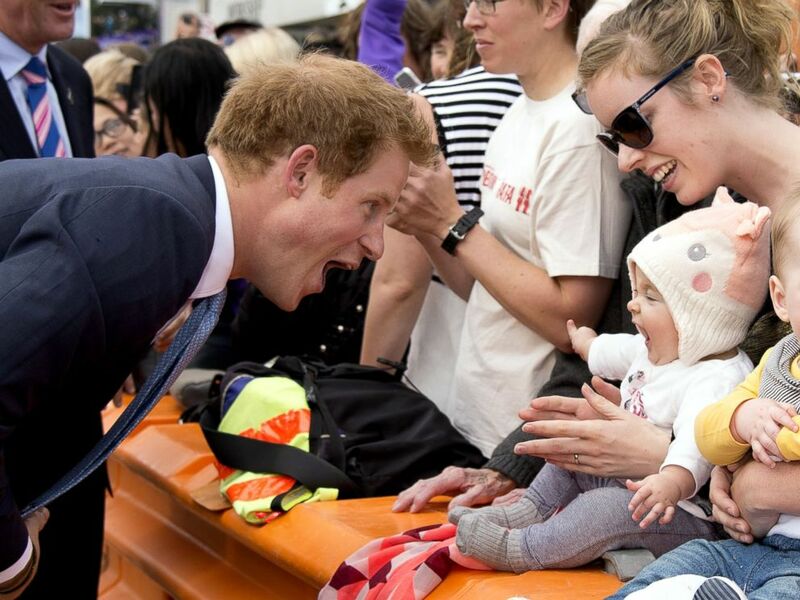 Prince Harry greets a baby at Cashel Street Mall in Christchurch, New Zealand, May 12, 2015. When Prince Harry travels to Walt Disney World in May for the Invictus Games, to be held at the ESPN Wide World of Sports Complex there, he will bring with him fond memories of going to the theme park with Princess Diana as a child. "It's one of my very, very happy memories, of going to Disney World with my mum," Harry said. “I went on ‘Space Mountain’ 14 times. I was like, 'This is absolutely fantastic. This is the best thing ever.'" "There's all sorts of places over the world where we were very lucky to have those moments with our mother; and very, very happy memories," Harry said of himself and his brother. Prince Harry also spoke candidly about another formidable woman in his life, his grandmother, the Queen, who will turn 90 in April. "Because of my time in the service, [I have] the utmost of respect, not just for her as a grandmother," Prince Harry said. "She was my boss for 10 years and I viewed her very much like that." "Now it's really nice because I can go to her for advice and bend her ear with all the experiences she's had over the years," he said. The second Invictus Games will take place May 8-12. Tickets for the games are available at Invictusgames2016.org. The 2016 Invictus Games will be broadcast on ESPN. The Disney Co. is the parent company of ESPN and ABC News.